Something to brighten up smiles with: our colorful Gingerbread House Cake Pops Gift Bouquet includes 10 Cake Pops in beautifully delicious Holiday designs! Individually Cello wrapped with decorative box. If you need 12 or less, you can order here. If you need 13 or more, click the REQUEST ESTIMATE tab above to contact one of our Gift Experts. Fill out the form below to request an estimate. If your order is below 13, expedite your order by making an immediate purchase using the form on the tab above: "Order Now". 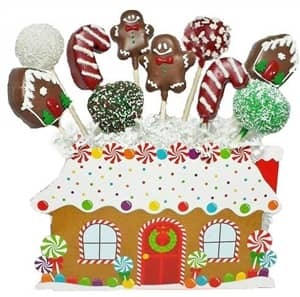 Our delightful Gingerbread House Holiday Cake Pop Gift Bouquet includes 10 Cake Pops in deliciously merry designs such as: Gingerbread Men, Gingerbread House, Candy Canes and assorted designs. Gift Box Dimensions: 8 1/2" x 4 1/4" x 5 3/8" , box design may vary based on availability. Height of cake pop is 8"